On some days the mere thought of reading a newspaper is daunting to me. Why? Because I know that I will inevitably read about terrible things that I don’t really wanna know about. I will be sad and grumpy afterwards and question humanity and momentarily forget to focus on the things that I can change and not on the ones that I simply cannot. Visiting Parva Domus was my favourite study trip experience and it had quite a different effect on me. Upon arrival we were greeted by Davide, who co-owns this agriturismo with his wife. 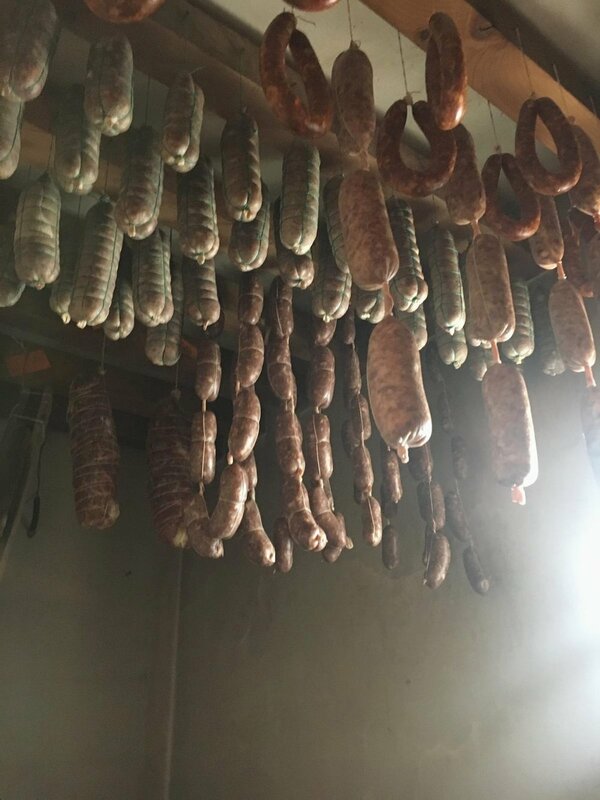 Davide worked in a publishing house in Turin and had no farming background, but decided to dedicate his time to raising pigs and learning how to make salami. They started with a bed and breakfast in 2006 and then started to raise pigs as well. Today there are over 100 pigs, that stay outside the whole year. They mainly produce salami, made artisanally in their own little kitchen, but also lardo and pancetta. During our visit Davide showed us one of his sows with her piglets, followed by the chickens, protected from hungry foxes and hawks by watchdog Angie. Our next destinations were the area where the pigs live, the laboratory and the little cellar where the salami are waiting for their turn to be eaten. Davide mentioned pretty early on that his story was a „typical italian story“, refering to the fact, that the government doesn’t make it easy for small producers like him. Currently he tries to transform an abandonded and overgrown ex-military area to a living space for his pigs. Visiting this area was the last stop of our little tour and we left after having a delicious lunch at the property. Why was this my favourite visit though? Because I felt hopeful after I left. Not because Davide’s story was perfect, but because it was authentically told. The news that we hear or read often try to capture our attention with drama and negativity and usually it takes me a little while to recover and stop moping. There certainly is enough going wrong in the world, but sometimes what we need is a little reminder that there are still people that try – nevertheless- to change something for the better. One step at a time.